Tillerman has started a group writing project for reviews of the best and/or worst sailing movies ever. Having only seen a handful of sailing movies, I felt completely unqualified to join in. Instead I turned to Google and found Geni and John’s Nautical and Ailurophile Page with John’s Sailing Movie List where he has listed and reviewed every movie he could find that had something to do with sailing. I’ve heard of more than I thought but it appears there are many sailing movies out there that are worth seeing. He rated White Squall pretty high and we were in agreement on a few others I had seen so I’m going to cheat off of John even though he hasn’t updated his list since 2011. Also, I’m essentially changing the writing project to a shopping list of sailing movies that a sailor should see. 1979 Simply the all-time best small-boat sailing/adventure movie! The movie manages to capture the spirit and ambiance of Erskine Childers' 1903 novel, and, with the exception of deleting the Baltic sequences, and the character of Capt. Bartels, remained remarkably faithful to the book. Simon MacCorkindale and Michael York are perfect as Davies and Carruthers, and are well supported by a superb cast, including Jenny Agutter, Jurgen Andersen, and Alan Badel. All the elements that made the book a classic are here. 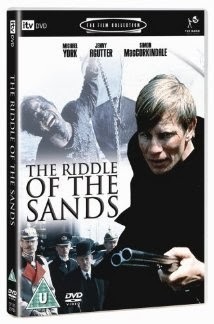 A must-see for all sailors, finally available on DVD in the US. 1986 Sissy Spacek, Kevin Kline, Bonnie Bedelia. An endearing and well-crafted love story set in a small town on Maryland's eastern shore. This movie has some excellent small boat sailing sequences, including a pretty exciting Hobie cat race. Sissy Spacek is portrayed as a competent sailor, with sailing as an important element in both the plot and in the relationships between the characters. This movie is particularly appealing to me because the characters approach sailing the way most of us do; it’s their recreation, it’s what they do for fun. 1975 Comedy about Prohibition rumrunners with Burt Reynolds, Gene Hackman, Liza Minelli, Robbie Benson, John Hillerman and a yacht named Lucky Lady. (Liza was nominated for a Golden Globe for Best Actress in a comedy). This movie sticks in my mind because if I remember correctly, they gave away the sailboat as a promotion for the movie (and I think Lucky Strike cigarettes had something to do with it - but I'm not positive). Anyway, I didn't win it, and had to wait 20 more years to get a large wooden sailboat. I recently bought a DVD of this movie, and watched it with the wife. It starts kind of slow, and a little lame, but picks up, and becomes a very enjoyable film. There was actually quite a bit of sailing in the movie, and Burt, Liza and Gene looked like they were having fun making it. Aside from the one sailboat, there are about 40 power boats in the movie, and at the climax they are all on the screen at the same time. It’s one of the few sailing movies where the interior scenes were shot on a boat at sea. According to the director’s commentary, they shot the movie aboard the boats, on the Sea of Cortez, without models, or tanks. He said it was absolute chaos, which is why it’s so rarely done. Excellent! Thanks for participating in the group writing project. I will put those movies on my list to see too.